Think about it like this: What happens when you have everything, well almost everything? Is it possible to reach that status when there is nothing to be concerned about? I guess I went too far with it, but when it comes to music, and we are talking Metal mostly, it is conceivable to embrace enough to feel the vibrancy, a pure sense of variety, as if you can be anywhere while standing still. Whether on drugs or not, I assume that Progressive Metal has its ways of getting into thick skulls even without being commercial. 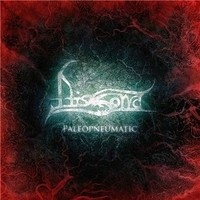 I came to know the Chicago, US bred Metal in progression entity called DISSONA. Following my long session with their album "Paleopneumatic", my senses were overloaded. Treading under the canopy that is received as Progressive Metal, DISSONA made sure that their efforts won't be just around the known circle of DREAM THEATER, but to engulf other territories. Taking on veils of the extreme, bounding LEPROUS, IHSAHN, KATATONIA and even the early endeavors of PARADISE LOST, the Americans knew well how to mish mash this darkened Doomish direction with the tougher complexities of HAKEN for instance. Therefore, the listener will end up with an intricate and articulate turbulence that is always on the move, shifting from side to side, constantly changing its appearance, deadly and in for the kill. DISSONA cradled immaculate riffery, assorted time signatures, operatic and growl vocals, keyboards and FX infused tracks, but were able to master the flow to assume total hold over the mind as the songs kept going. Furthermore, and this is my favorite aspect of this album, the fact that nearly each song on the album is a different story, at least it felt like that, a theatrical piece carefully worked and thought through. Honestly, two tracks actually made it a different Progressive Metal experience for me. I mentioned that DISSONA dwelled into the extreme as well; therefore, I was taken by the influence of songs such as "Totality" and "Breach". The former is an amazing mixture of Doom / Death Metal with the arts of progression, a rather slow temp tune, haunting in its special way. The latter is an uncontrollable rage, a storm of emotions, blast beating its way rapidly into darkness. Sure that there the album has a lot more to offer and I dare you guys to try them out. This is a band that needs to be heard and taken into account.